The word “Tariq” stems from the root “taraqa” meaning “knocking, striking.” In many translations of the Quran this word was taken for a name and left untranslated. But if the word is translated as “to pulsate”, the basic meaning of the word, cosmic physicists would witness an interesting connection. In the second verse of the sura, “The Knocker”, we read: “How will you comprehend what The Knocker is?” A spoonful of matter taken from a pulsar would weigh one billion tons. Were we to depose a small particle of it on earth, the particle would pierce it and end up in its center. Just think of it, a spoonful of any matter on earth hardly weighing more than a few grams! This shows how difficult it is to conceive of a pulsar. 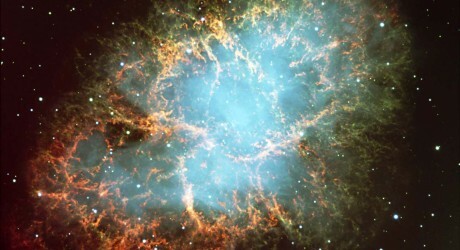 A pulsar is produced by the compression of stars a couple of times bigger than the sun. If we were to compress the earth the same way, we would end up with a sphere with a diameter of several meters. The diameter of a pulsar can be about 15-20 km. It takes the earth 24 hours to rotate around its own axis, whereas the pulsar rotates around its own axis many times per second; all these things show how difficult it is to comprehend this striking, pulsating star.